By Will Meek, of Vancouver Psychologist. One of the biggest questions being tackled in the subjective well-being/happiness literature is whether we can achieve sustainable change to our happiness level, or whether we can only achieve momentary departures from our baseline disposition. The answer to this question has been different (yes, no, maybe) depending on the angles and variables employed by each researcher in attempting to answer it. In 2005, a team of U.S. researchers developed a comprehensive model of sustainable happiness change that integrated the major lines of the subjective well-being literature. The result was a theory which proposed that up to 50 per cent of one’s happiness was rooted in a genetically determined set-point, 10 per cent was related to circumstantial factors (nation of residence, demographics, culture, income, etc), and the remaining 40 per cent was determined by intentional activities such as pursuing goals, looking at things optimistically, and being physically active. The keys to sustainable happiness change rest in these activities, and the first direct empirical validation for the theory is my favourite article from the past 3 years. Kennon Sheldon (Cal-San Diego) and Sonja Lyubomirsky (Cal-Riverside) creatively examined differences in well-being for university students over the course of several months, capturing real life changes in life circumstances and happiness related intentional activities. The main conclusions drawn from the three studies were that changing circumstances and engaging in happiness related activities both offer a boost to one’s happiness, but that people habituate to circumstantial changes whereas continuing the activities sustained increases in happiness, subjective well-being, and psychological well-being. 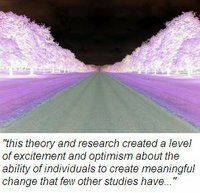 As a clinician who works with people trying to become happier in one way or another, this theory and research created a level of excitement and optimism about the ability of individuals to create meaningful change that few other studies have. For me, that implication combined with the creative methodology and the comprehensiveness of the theoretical model made this a standout piece of work. Sheldon, K.M. & Lyubomirsky, S. (2006). Achieving sustainable gains in happiness: change your actions not your circumstances. Journal of Happiness Studies, 7, 55-86. William D. Meek is a doctoral candidate in counselling psychology at the University of Missouri - Kansas City, and current pre-doctoral intern at the University of Delaware Centre for Counselling and Student Development. Awesome, the link to the article did not work btw.